Way back when, when I went around interviewing for faculty jobs, there was one particular interview which I really enjoyed. Usually, you get to have a dizzying sequence of brief interviews with faculty members (no, this is not a tribute to David Foster Wallace), but in that one, unusually, I also got to meet with a delegation of graduate students. We had breakfast together and they asked me a few questions, and I got to see an aspect of the department you usually don’t get to see in an interview. One question they asked stuck in my mind, maybe because I did not provide a good answer. Suppose you have a graduate student, just at the verge of discovering their own voice, maybe after completing their first project. They come to you with their first own idea, but the idea is not that great. It is not terrible, you cannot point out immediately any obvious flaws, but it doesn’t look like it is going to work out, and even if it does it may not be worth the effort. What do you do? I thought I would give you a physics puzzle to solve for a change. This puzzle was posed to me this week right before lunch and we had a fun discussion with my colleagues about it. The great thing about the puzzle, is that you can check for the solution in your kitchen if you have a machine to measure weights. Many cooks do, so you can become an experimental physicist for a day if you want to. The puzzle involves typical things that you can find in your home, like water, and a container for it. It also involves lead (in the original puzzle), which is substituted by a blue egg in the picture. If you have never seen blue eggs, go to a traditional chinese food store near your place and ask for duck eggs. So now you have all the ingredients. So the idea is that you suspend the egg from a string (you can use superglue), and you lower it slowly into a container of water, but the string supports the weight of the egg. You can hang the string from your favorite support, like your finger. The water is seating atop an instrument that measures its weight. 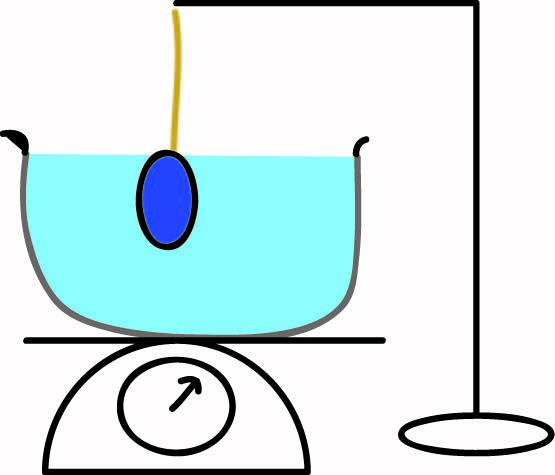 The question is: if you lower the egg in the water, will the weight marked in the register increase, stay the same, or decrease. There is more than one way to think about the puzzle, but in the end you should always arrive at the same answer. The really important question is if the weight on the measuring device changes, by how much does it change? Incidentally, this reminds me of a time when I was in graduate school when lead was found in the water pipes of the university I was in, many many years ago. The water fountains in the building were closed with yellow warning tape, and right next to them a big water jug dispenser was placed so that people could still get water, but not from the tap. Someone with a good sense of humor (I imagine it was a physics graduate student) put signs on the water fountain from the pipes and the bottled water. The signs said “Leaded” and “Unleaded”. As expected, I got too busy with the day job. Consequently, this week I was unable to contribute to the type of entertainment and physics fun our 3 readers got used to in the past, er… week or so. This week there is a department review going on, and this means way too much paperwork and politics, and probably some third p I am missing right now (but it sure ain’t physics). Life as faculty member is not always as glamorous as it appears to be in the popular imagination, there will always be weeks like that. So, in the meantime, something I encountered while browsing the new journal Physics, which seems to be a pretty decent way of keeping up with current stories in, well, physics. Here is a good piece by Stanford’s Shamit Kachru, of KKLT (and Rutgers basketball) fame, writing about one of the very recent developments in string theory, the attempt to find gravitational duals for cold atomic systems. Enjoy!